You ever wonder what it costs to produce an advertisement? At Ydraw we turn down a mountain of clients each and every week because they feel our prices are just too much. But how do our prices stack up against other companies? And just how cost effective is a whiteboard animation compared to other forms of advertising on the market? I’m going to start with whiteboard animation, since that’s what Ydraw is primarily known for — though our library is quite diverse in terms of the types of products we offer. A whiteboard animation running sixty seconds costs $7,500. This includes the customer’s choice of voice over artist, visual artist, a screenplay, and music/SFX. The average outlay for a commercial during the fifth season of AMC‘s “The Walking Dead,” making it the costliest scripted series on TV. The Oct. 12, 2014, season premiere drew 17.3 million viewers; the March 29 season finale, 15.8 million. According to averages from media buyers compiled by Ad Age during the upfronts; ratings according to Nielsen. The amount Snapchat demands per “Brand Story” ad, a branded post (or “snap”) that appears within the app’s “Stories” feed. Snapchat doesn’t disclose user numbers. According to media buyers interviewed by Ad Age, January 2015. The cost for a thousand impressions on Hulu for standard run-of-site in-stream video ads, with a minimum requirement of two ads per campaign. According to Hulu’s rate card, March 2015. The cost of 30 seconds of ad time in the championship game of the 2015 NCAA Men’s Division I Basketball Tournament on CBS, when Duke will take on Wisconsin. That’s up from $1.49 million in 2014. Last year the championship game averaged 21.2 million viewers, down from 23.4 million in 2013. According to Kantar Media, Nielsen and media buyers interviewed by Ad Age. The average cost for 30 seconds of commercial time in prime time broadcast TV last year. That’s up from $110,00 in 2013. The average cost of a 30-second commercial during “The Big Bang Theory” on CBS, the most expensive comedy on TV. “Big Bang” averaged 16.7 million viewers this season through March 12. The cost of one full-color ad on the front page of The New York Times. To appear on the Times’ front page, though, marketers must commit to a certain frequency, such as front-page ads every Tuesday for six months; the total cost of running frequent page-one ads would likely top $1 million. According to current and former Times executives interviewed by Ad Age, March 2015. The average cost of a thousand impressions for a 30-second commercial in broadcast prime time in 2014, down from $25.06 in 2013. The cost of a thousand impressions for a sponsored photo on Instagram, down from $40 in 2013 when Instagram first rolled out ads. Instagram says more than 300 million people around the world check out the photo-sharing app each month. Instagram’s minimum ad spend is $200,000. According to rate cards provided to media buyers by Instagram in spring 2015, before any discounts; minimum spend is according to a media buyer interviewed by Ad Age, March 2015. The cost of a thousand impressions for a sponsored video on Instagram. According to rate cards provided to media buyers by Instagram in spring 2015, before any discounts. The cost of four weeks on Times Square’s biggest billboard, Clear Channel’s eight-story sign on Broadway from West 45th Street to West 46th Street. According to sources familiar with the sign’s cost as of March 2015. Can you imagine paying over a million dollars for an ad that runs less than one minute? A Whiteboard video falls in line with the final choice: Web Content Marketing Campaign. So, while the upfront cost of $7,500 for a sixty-second ad might throw you off, consider it a lifetime investment in terms of how you can promote your business. 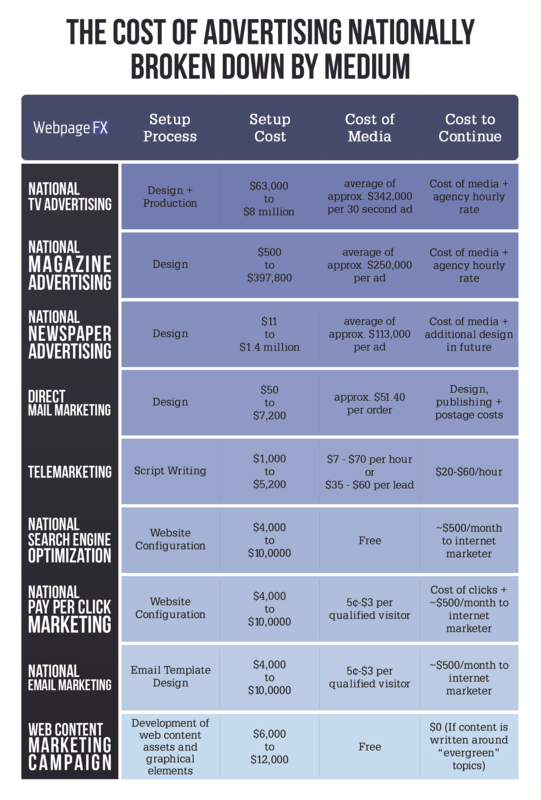 Other campaigns, such as magazine or newspaper ads require constant updates and monthly fees. And while you’re certainly guaranteed to get a lot of impressions, chances are only a small percent of them are catering to your audience. You have a little more leeway in this regard with a television or radio ad since you can choose which time of day, or programs to run it; therefore, guaranteeing the audience is at least fit for your product. But, again, the fees. Lots and lots of fees. Plus, such ads quickly become dated. Or, they may not even be seen at all! According to an article written in The Guardian in 2010 (! ), it was reported that nearly 90% of audiences skipped through TV advertising. Such is common practice in today’s high-tech world of streaming services, and DVR satellite systems that let you fast forward through advertisements. Ask yourself: when was the last time you truly paid attention to the commercials during a TV show, sporting event (outside of the Super Bowl), or movie you were watching? In my house, we have our smart TV connected with our Google Movies account. Between that and Netflix, Hulu, and HBO Go, our exposure to TV advertising is quite limited. Same with radio, where most ads go unheard because there are so many more convenient streaming options for music these days. Now, the thing about a Whiteboard video, specifically, is that it features eye-catching visuals that are designed to attract an audience’s attention. And there are so many inexpensive ways to market them. You can put your Whiteboard video on Facebook, and then, using the site’s unique features, ensure it gets seen by your target audience. You can customize the features to allow only specific states or regions to see your content, and you only pay when a potential client clicks your ad. That cuts out a lot of needless excess cost. No, I’m not here to advertise for Facebook, but merely to demonstrate the myriad of ways you can use a Whiteboard video. You can post them on YouTube, or simply post them on your website. You can share them with clients, potential clients; use them at shows, and even put them on TV if you’ve got the budget. And you can do all of this for $7,500! The DGA (Director’s Guild of America), of which I am a member, considers low budget commercial work to be $75,000 per day, up to $225,000 for a three-day production. Most national commercials are several hundred thousand dollars up to a few million dollars. Directors are typically paid anywhere from $10,000 to $50,000 per day of shooting, but many times that means $25,000 for a one-day shoot that also involves two weeks of prep and another week bidding on the job against other directors. Yikes! Does that ad reflect the company it’s promoting well? See the difference? Which business looks more professional? Which one required the least amount of time and headaches to produce? So, before you dish out a gazillion dollars on a thirty-second TV, radio, or newspaper ad, give Ydraw a call. Our process is simple and guaranteed to produce the results you’re looking for.